I came across a site today that claims it has a system that can provide an opportunity to earn up to $1,700 a day with minimal effort required. 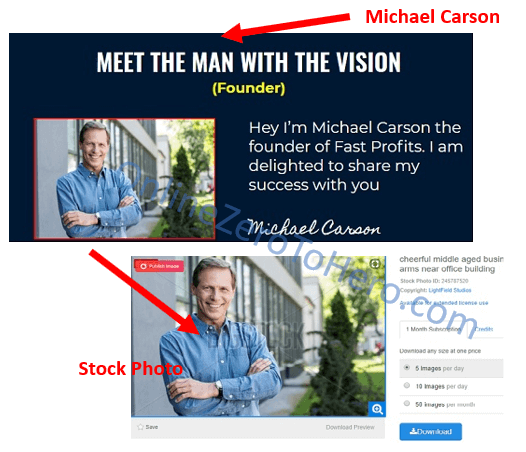 This program is called Fast Profits Online and it’s created by Michael Carson, a so-called consultant, business analyst, and owner of this program. If you’re one of the people who has visited their sales page, then you might want to know if this program is a legit opportunity that can deliver the results you’re looking for. 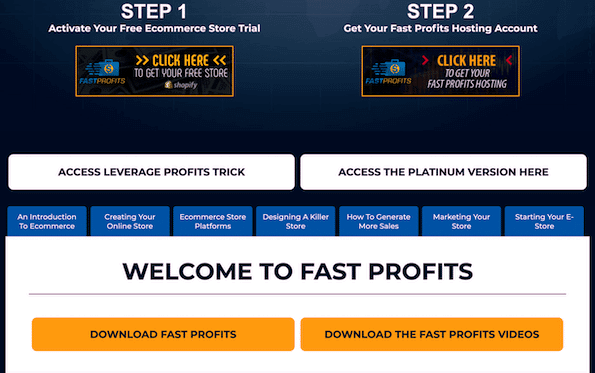 So, is Fast Profits Online a scam or is it your road to financial freedom? You will soon be able to answer that question on your own, as I will provide you all the essential information in this Fast Profits Online review. I hope it can help you make an informed decision about this program. Fast Profits Online is a program that claims it can help you make $1,700 a day with minimal effort required. Based on the claims of its creator, Michael Carson, it is actually a secret system that revolves around dropshipping. Dropshipping is a legit business model, but creating an ecommerce site, in my opinion, is not that simple. Especially if you don’t have the technical skills and knowledge in that particular field. However, Michael claims that you can easily set up a site using their secret system, which I think is too good to be true. Honestly, I don’t recommend this program because it contains several red flags that make it a risky investment, in my opinion. I would suggest that you find other alternative ways to create a decent income online. 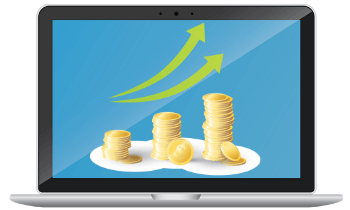 What is Fast Profits Online and what does it offer? According to Michael Carson, this is a revolutionary new system that revolves around dropshipping and you will be able to earn up to $1,700 a day by building your own Shopify store. Based on their sales video, this program is for everybody. Even those with no prior experience to dropshipping can make money using their secret system. If you’re still new to dropshipping, it is a type of business model where you sell products using an online store through platforms like Shopify or WordPress, but you’re not keeping any physical stock of your products. So, when someone places an order on your store, your partner who is also a wholesaler will fulfill the order on your behalf. It is a legit business model that is being used by accomplished business owners and over the years, several people did earn a decent amount of money by way of dropshipping. However, it took them time, effort and some proper training to achieve the level of success they are enjoying now. In my opinion, no matter how good the sales pitch on their video, there’s no shortcuts or secret systems that can magically generate money for you online. But according to the creator of this program, the process of creating an online store is a breeze, because they claim that they have a secret system that will make the whole process simple. I’m not saying that creating a dropshipping store is overly complicated, but you can’t do it in just 1 hour of work like Michael claims on their video. Fast Profit Online Red flags? If you’re like me it’s just normal for anybody to be skeptical, especially if you’ve seen some outrageous claims that you can easily earn a ton of money by just using a done-for-you system. No matter how good the claims are on their sales page, you still need to do your homework and search for honest reviews on the web that can help you in your decision-making process. That’s why I did a thorough investigation of this program and I found several red flags that I think I should share with people who would like to know the truth about this program. Here are some of the red flags that you should know about. Red flag #1 – Is this program beginner-friendly? When you watch their sales video, the very first thing you will notice is the way Michael promotes this program like it was really made for beginners. In fact, the way he explains the whole process of creating a dropshipping site and getting leads to buy the products on the site is as simple as just working 1 hour per day. According to him, it’s all because of their secret system which he is not interested to reveal to you, and you’ll need to be a part of their program to fully realize the benefits it can give you. I know it’s exhilarating to see all the income proofs coming from their so-called successful members, but in reality, we cannot verify those claims or if they really have their own dropshipping sites. In my own experience as an affiliate marketer, creating a website without any technical know-how or at least some training will be difficult. You’ll need the help of a freelance web developer to build your dropshipping site and that will cost you some money. Not to mention the costs you’ll need to consider when you’re going to promote your site through paid ads. In my opinion, starting a dropshipping site requires some technical know-how and experience in popular ecommerce platforms like Shopify and WordPress, so this program is not really for beginners like what they have claimed on their sales page. This is a significant red flag that you should think about when you’re planning to join this program. Red flag #2 – Are those real testimonials? Another thing I would like to point out are the series of testimonials on their sales video. It seems these so-called customers have earned a lot of money using their system. However, when I checked some of the people on their video, I found out that these are Fiverr actors who are being paid to do these testimonials. These are freelancers from Fiverr and they are being paid to do their testimonials. So, in short, these are NOT genuine testimonials from real customers but freelancers acting as a customer. This for me is unethical and a cheap way of gaining your trust, especially if you’re not familiar with some of those people on their testimonials. I have been writing reviews for quite some time now, so I could recognize some of them since they have also appeared in other shady programs that I have reviewed in the past. 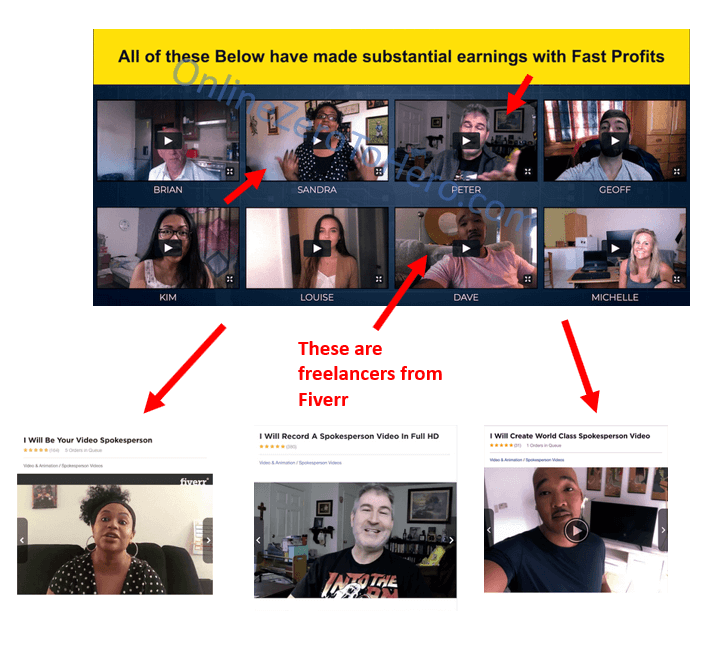 In fact, one of the guys on their video appeared in other programs I have previously reviewed called Fast Cash Club as well as in the sales video of Easy Insta Profits. I would suggest that you take this red flag seriously before you make your final decision because using fake testimonials is NOT something you’ll do if you’re confident enough about the program you sell and if it can really deliver the promises you’ve made on the sales page. The initial fee for this program is $37 but that’s just your payment to their membership page where you will be given access to their basic training videos. You can clearly see that there will be upsells after you purchased the program. After your initial payment, you’ll be greeted with a bunch of upsells starting with the “Platinum upgrade ($197)” and also the “Leverage profits trick upgrade ($197),” both of which are pieces of training about dropshipping and ecommerce. Based on my own research, I found out that the secret system that they are enthusiastically promoting on their sales page is just a bunch of PDFs about making money online through ecommerce. Now, I’m not saying that these training materials have no value, but it’s way too expensive for someone who is just starting out with ecommerce and dropshipping. In my opinion, they should have been more transparent in explaining to their prospects that they will need to pay more than the $37 initial fee that they are advertising on their sales video. I think It’s just too good to be true to earn $1,700 a day when you only paid $37 to get access to their membership page. That’s why this is another major red flag that you should consider before you decide to join their program. Red flag #4 – Is Michael Carson a real person? According to Michael, he made over $3 million using the Fast Profits Online secret system and he wants to share it with you. But who really is Michael Carson? Based on my investigation, the photo he shared on their site is actually a stock image so I can safely say that Michael Carson is just a pen name. The photo of Michael Carson is actually a stock photo. The real owner and creator of this program is NOT really interested in sharing his or her real identity, so this is just a deal breaker for me. How can you trust a program that promises you to earn $1,700 a day when you can’t even verify the identity of its true owner? If you can’t contact the creator of a program because they are not referenced anywhere on their site, then you will never know if it’s a legitimate opportunity you can rely on. You wouldn’t want to waste your hard-earned money on something you are not sure about and you don’t even know who you are dealing with in the first place. Another red flag that I found on their site can be found on their earnings disclaimer. It is clearly stated there that they can’t promise you success. They can’t promise you that you will succeed in their program. In fact, they want you to know that you’ll only be successful if you devote time to acquire the skills and knowledge in their training materials and put them to use. So, if that is the case then why would they claim that their system will only require you to work 1 hour per day? This is very different from what they are saying on their sales page and I think they do know the true requirements of starting an ecommerce business. Like in any endeavor in real life, you’ll need to invest time, effort and some patience to achieve your goal. There is no such thing as easy money through a secret system, it doesn’t really exist so I would suggest that you think long and hard before you make your final decision about this program. I have shown you all the red flags and info about this program. I think it is time for you to decide if this is an opportunity that could lead you to financial freedom or is it just one of those scams that you need to stay away from. To help you more in your decision-making process, let us sum up all the pros and cons of this program. Overall, I cannot recommend this program because it has several major red flags that make it a risky investment, in my opinion. Starting an ecommerce or dropshipping business is a legit opportunity online, but you’ll need to invest some effort, time and proper training to succeed. You can’t rely on a secret system to simplify the whole process. It just doesn’t exist and if you really want to start an ecommerce site then you’ll need to devote more time to it. I would suggest that you find another legit opportunity that can truly provide you a better way of making money online. If you want to create a decent income online, then I urge to check out my in-depth guide, where I will share with you the most effective way of making money online. These are the same steps I used to create my full-time income online, and I still recommend it today because it’s the most ideal way to start a career in online marketing. I also promise that my guide will only teach you ethical methods and I will even show you how you can start for FREE. If you have any comments, questions, or have any experiences with Fast Profits Online, I would love to hear from you in a comment below.